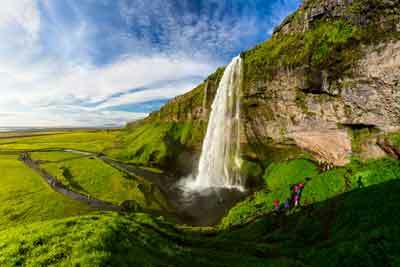 Seljalandsfoss is a popular waterfall located in South Iceland where the Ring Road and the road to Þórsmörk split. The river Seljalandsá which originates in the famous Eyjafjallajökull glacier plunges down about 60 meters. 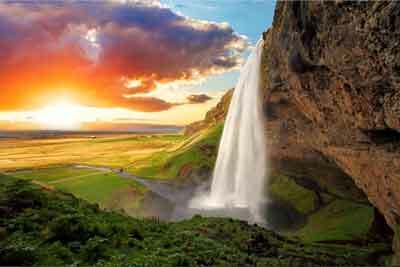 What makes this waterfall really special, however, is that you are able to walk behind it. Just remember to bring good shoes and a waterproof jacket, you might get wet! The ground behind the waterfall is not paved and uneven so please always be careful. 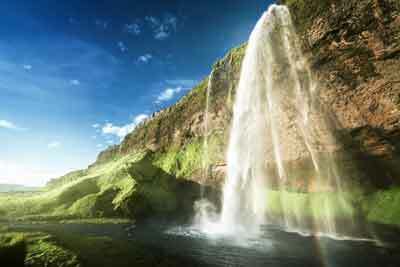 This location is visited during tours covering the south alongside Skógafoss waterfall and the town Vik. Currently there is a controversy going on about a big information center being build there. More service is necessary but the people opposing the plan say a big center may ruin the view of the waterfall.